(Newser) – If everything goes to plan with China's space program—which so far everything has since the country launched its first astronaut in 2003—it will become the first country to land a probe on the "dark side of the moon," the AP reports. This week, Zou Yongliao of the Chinese Academy of Sciences announced plans to send a probe designated Chang'e 4 to the moon's far side by 2020, according to the Asia Times. "China will be the first to complete the task if it is successful," Zou said. 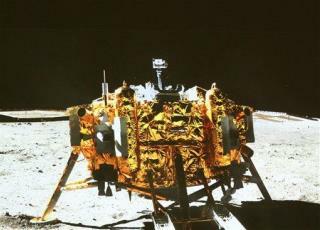 In 2013, China became the third country to land a probe—Chang'e 3—on the moon, following the United States and Soviet Union. Time will tell on this. Their economy is in the dumpster, their air is filthy, they have internal, civil rights issues and they continue to be provocative with their island building. Can they do it all and be successful? Please QUE the MUSIC in the background from... Pink Floyd- Dark Side Of The Moon! (EXCELLENT) Please! There ya go ALL!